Ah I'm so happy I'm starting to share Christmas excitement on the blog. This is my second Christmas post and one I am hugely excited for. I am a big fan of Charles Dickens' A Christmas Carol and have always wanted to know more about the other characters, so what a treat it was this year to see that Vanessa Lafaye had released a story about Jacob Marley's sister. I must say that when I read the notes at the back of the book I was sad to hear of Vanessa's passing, but how lovely that her dear friend Rebecca was able to continue her story. I never expected a story to be written surrounding A Christmas Carol. It felt like it was untouchable and no author would even attempt at it, but Vanessa's story is a tribute to the main story. 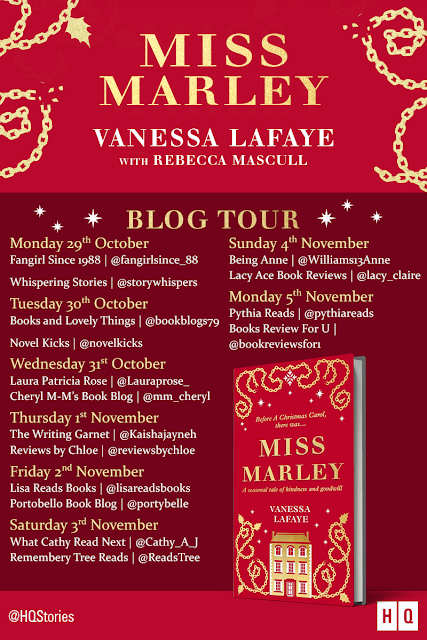 Miss Marley is Vanessa's take on how Jacob Marley came to be the hard-hearted cold man he was and ended up as a ghost in chains and how he impacted so negatively on the lives of even his own sister who he had sworn to protect. It is a sad story but we know how it ultimately ends for Jacob and that it would be too late to save him. This is why it was refreshing to get insight to a new character, Jacob's sister Clara and her story. Jacob and Clara didn't start out poor but devastating consequences meant they were kicked out onto the streets by their very own uncle. Vanessa really captured the unforgiving world of London's Victorian streets especially in the bitter cold. It was every man, woman and in lots of cases child for him or herself and every one was out to get you if you could claim the smallest thing to your name. Vanessa takes us from Jake and Clara's demise right to the relatively rich people they became and how they got there. It was fascinating to see how both were affected so differently by what they went through. From Jacob becoming cold and callus to Clara being more forgiving and willing to help those less fortunate. You wouldn't know that Rebecca had continued this story as the writing continues so seemlessly that if you didn't know then it wouldn't even cross your mind that another author had taken over. A real credit to A Christmas Carol, this wonderful little prequel would have done Dickens proud.